Robert Downey, Jr. in court. Again. A talented and beautiful actor, Robert Downey, Jr. is a Level Two Archetype for the Ten of Swords, because he lives on the precipice of Ruin. This is ruin brought on by an inability to take responsibility and control over one's own life. Robert Downey, Jr. could conceivably conquer ruin. He's still talented, still beautiful, and still gets work. Most of all, he's still alive. 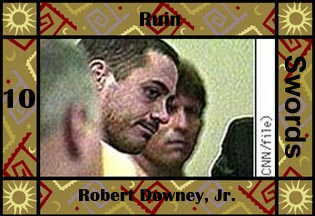 Robert Downey, Jr. was in trouble at CNN, 12/8/97: "Judge Sends Oscar-nominated Actor To Jail For Six Months"
A Tribute to Robert Downey, Jr. The Daily Iowan, 7/18/96: "Downey, Jr. Released After Arrest"
CNN, 10/7/97: "Probation revoked for Robert Downey, Jr."
Excite, 12/8/97: "Actor Downey Jailed for Probation Violation"
Las Vegas Sun, 2/18/98: "Downey Goes from Jail to Studio"